A 10 page staple bound book which depicts a loose narrative through a series of illustrations & a short comic. 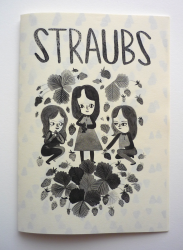 It’s about a group of semi-feral girls called The Straubs, who hunt giant strawberries & use them to make elaborate desserts & jams. 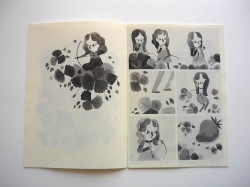 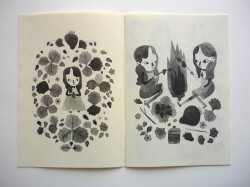 The paper is 80gsm, off white & is slightly translucent, so the pages show through.